For the past couple of weeks, we have focused on free agency, trades and cuts. Let’s put that stuff aside for the moment and shift gears to the draft. Now let’s talk about some of these players. Guice is a terrific RB prospect. The Eagles only chance at him would be to use pick 32 or to trade back into the early 2nd round. Would they do that for a RB? It doesn’t feel likely, but maybe he is a prospect they feel strongly about. Jackson? A CB? Are you kidding me? Jackson is a complete DB. He played CB, slot and even some Safety at LSU. The Eagles love versatile DBs. Jackson could come in and compete for the nickelback spot or be the #3 Safety. Like Guice, Jackson would take pick 32 or a trade back into the 2nd round. On to the Pro Day workouts. Brown had an awful showing at the Combine, but has good game tape. He is a massive LT prospect who can be a physical presence up front. Doug Pederson loves those guys. Brown is most likely going to be a mid-round pick. I’m sure Stoutland wanted to go work him out to get a good feel for the young man. Stoutland worked him out. What we don’t know is if Stoutland came away impressed or not. I would spend a pick on Brown. He has the potential to be a starting LT. That’s a guy I’m willing to take a chance on. Corbett is a different story. He played LT in college, but he’s 6-4, 310 and doesn’t have great feet so most people project him to OG in the NFL. OL coaches love Corbett because he is smart, tough and physical. 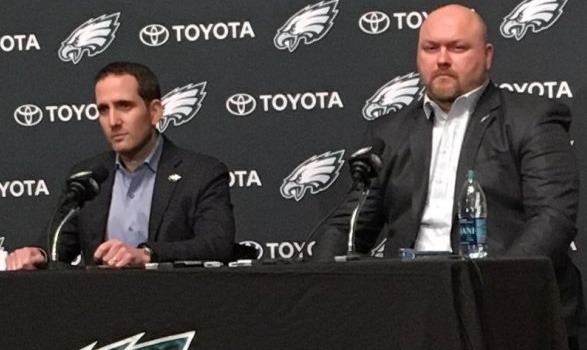 The Eagles could use a LG of the future. Corbett would make sense as a target. He could play some LT if needed, but doesn’t appear to be someone you want starting there on a regular basis. Corbett is probably a 2nd rounder. The Eagles need help at TE and Conklin is an athletic, talented pass-catcher. He is 6-3, 252. Conklin is a mid to late-round target. Expect to hear about more TEs as the Pro Day season continues. DT is another spot the Eagles are checking out. Shepard went to a D2 school, but now could be a Top 50 pick. He was terrific at the Senior Bowl and at the Combine. Frazier was a backup at Bama and is a late round target. Settle is interesting. He only started one year at VT, but is very talented. He is 6-3, 329. He had 12.5 TFLs this year and can be quick off the ball and disruptive, despite being such a big man. Settle could be a 2nd round pick. I think opinions on him are going to be all over the place. LB isn’t as much of a need since Nigel Bradham re-signed, but the Eagles do need depth there. I’m a big fan of Cichy’s. He missed the year due to injury, but his 2016 tape is outstanding. He was a 3-4 ILB in college, but could play OLB or MLB for the Eagles. Very instinctive. Minor is a priority free agent. He was the MLB for Cincy and was a physical presence in the middle of their defense. Big hitter. Sullivan is another prospect who could play in the slot. He’s 5-11, 190 and more quick than fast. He is a late round target. I’ll write more in-depth stuff on these players as we go along. Jimmy Bama wrote about the Eagles picks in 2019. With comp picks, the Eagles could have 11 draft picks next year. I don’t think this is by accident. The Eagles could have some veterans to replace and another group of free agents to deal with. Carson Wentz will likely get a big contract extension so the team will need a cheap way to potentially fill roster holes. That makes draft picks especially valuable.